Today I have a fab guest post for you from the fab Emma at Adventures of Adam, it's great to work with Emma on this post, which I love! I really like the nurturing involved in this activity and I'm sure that T would love to do this too! Spring is all around us here in the UK. From the early hours in the morning, we can clearly hear the birds singing in the garden. This has u to a discussion about what birds eat. So we went digging in our garden to find some worms and left them in the garden to see if any birds would take up the opportunity. Despite having a child shouting with excitement through the window, the birds took the worms. 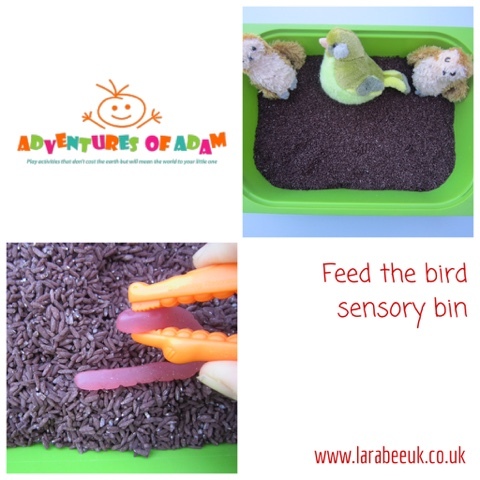 As my son was so excited about the process, I decided to make him a Feed The Birds Sensory Bin. Instead of using real worms in our sensory bin, I opted to use jell worms. The worms were slightly bigger than I had expected and looked more like snakes compared to the size of our birds but my son didn't seem to notice. 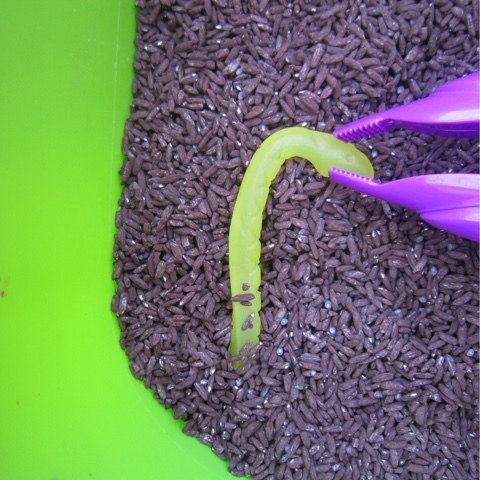 I placed the jelly worms in our green sensory bin and covered them with brown painted rice. 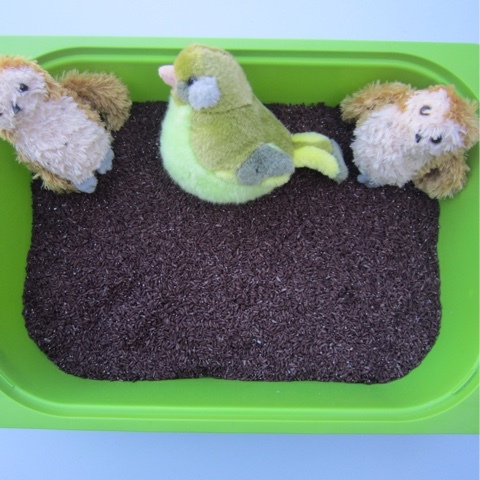 We had made the brown coloured rice some time ago for another activity. To make it, I simply poured rice and brown poster paint into a bowl and stirred the two ingredients together until the rice was completely covered. I placed the painted rice on a tray lined with baking paper and left it to dry over night. Finally, I added two owl puppets and a toy bird along with a variety of tweezer fine motor tools. 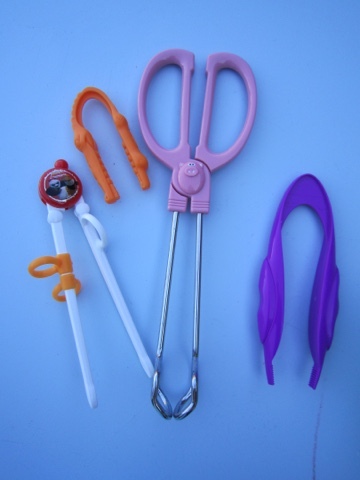 These included a CleverstiX Chopstick, a Gator Grabber from our Helping Hands Fine Motor Tool set, Piggy Wiggy Serving Tongs and a purple Jumbo Tweezer. My son had a wonderful time using the fine motor tools to hunt around the sensory bin for the jelly worms. 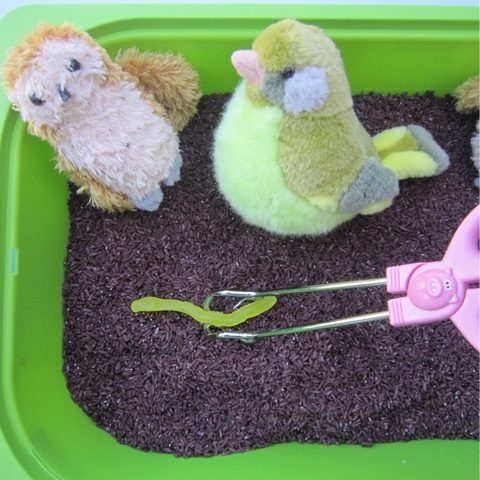 Once he located a worm, he had to attempt to pick it up using the fine motor tool and then feed the worm to the bird. He loved making noises that he thought each bird made when they ate. The Piggy Wiggy Serving Tongs proved to be too big to pick up the worms easily but my son persisted for some time. 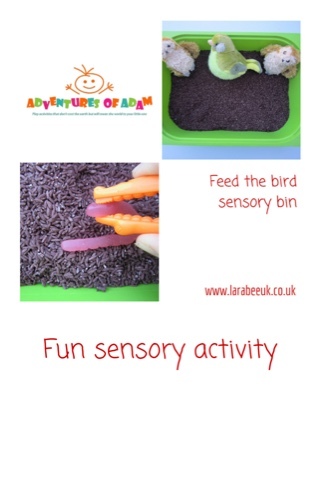 I love how sensory bins can initiate conversations. 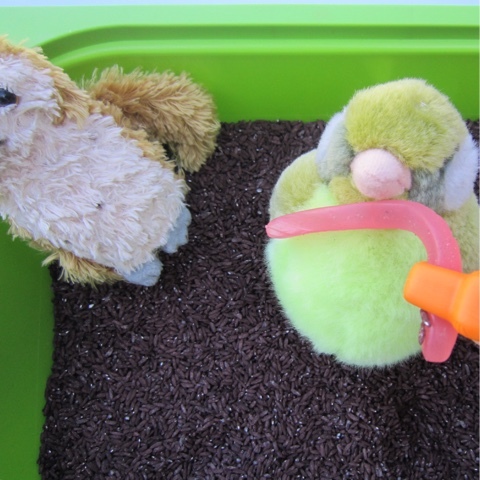 Throughout our Feed The Birds Sensory Bin, we discussed where birds live, how they find food and how they make their nests.